While the MGC was designed for use with a wide range of barrel sizes, larger sizes like 12 or 10 gauge may require a little break-in period for one-handed use. You can speed up the break-in time by working the foam portion with your hands or slipping it on and off the barrel. You will be able to slip the gun in and remove it from the MGC with just one hand. In the meantime, grab the barrel at the same height as the MGC foam holder, and use your thumb to push against one side of the foam as you pull the barrel from the holder. Wipe a small area clean with your hand or glove to place the MGC. Lean you gun into the MGC as vertically as possible (if it’s leaning too much to the left or right, it could slide). 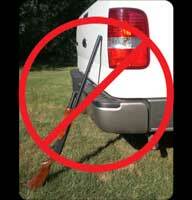 Remember, NEVER use the Magnet Gun Caddy with a loaded gun. The MGC also provides a great way to stage firearms going in and out of storage – just place the MGC on the outside of the storage unit for a place to set your gun while opening and closing the storage unit. The MGC can maximize interior capacity of gun lockers too. Just place the MGC anywhere and at any height you need to fill spaces open in your locker. It works Great with Fishing Poles Too! The MGC utilizes the strongest Soft (rubber) Magnet that can be manufactured. It's 1/4" thick with dual poles in both directions. Which means it's going to hold strong to the metal surface, resist sliding, and won't corrode. A balance was required between the holding strength of the magnet needed to safely secure the gun, but not too strong that it would cause scratching of a painted surface. The soft high-energy magnet will not scratch paint. Just wipe a small surface (to rid it of dust or dirt) and place the MGC. Well it's overly hard to pull off, but it is plenty strong enough to secure your gun. You can even drive around with the MGC on your vehicle all day - it'll stay. Check out the video below - it's rough, but it clearly shows the relative strength of the magnet and the holding power of the universal foam barrel holder. Note: The gun utilized in the video is a 20 Gauge o/u double barrel shotgun. 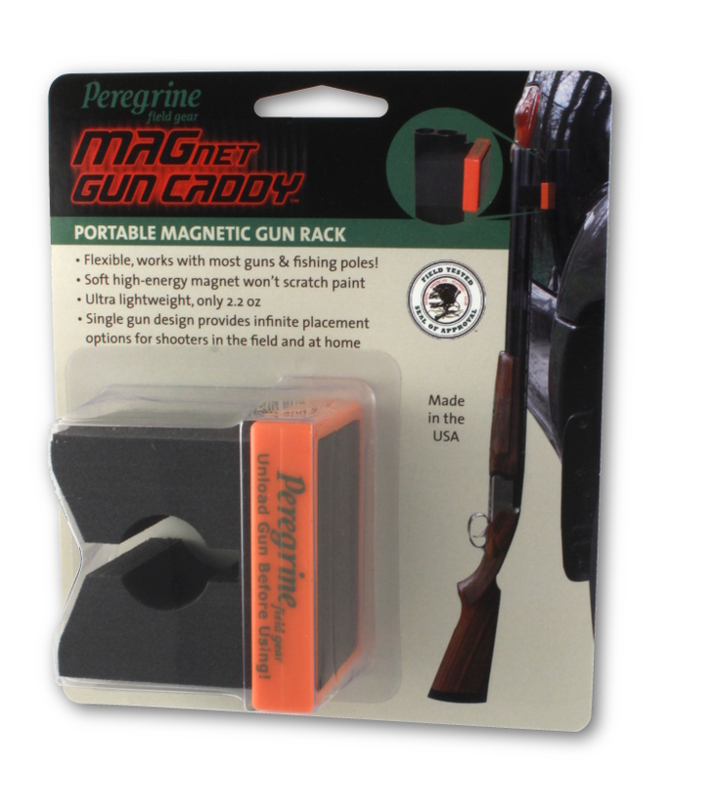 Note: This sporting goods version of The MAGnet Gun Caddy is NOT intended to be used in a moving vehicle to hold a firearm. It was specifically designed for stationary use (a temporary place to rest your gun). Always unload your gun before using.